Just ahead of Santa Claus the 8Coupe.com team has eventually managed to finish a project long in the making. The Vehicle Build Sheet Report (VBS-R) is filled to the brim with VIN specific unique background information that puts every conceivable statistical aspect for any given 8-series vehicle into a perspective. The information contained is not available elsewhere and by far surpasses what even the manufacturer would be able to offer. 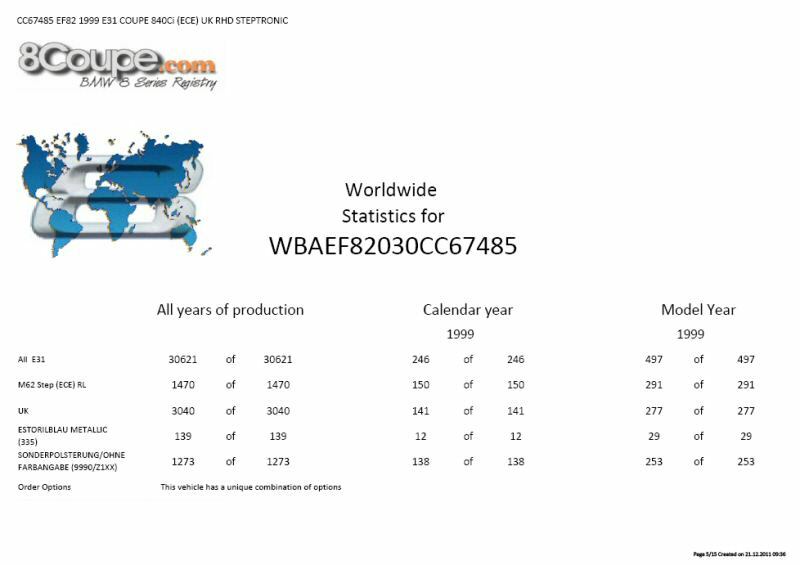 You will find precise figures for your car in relation to the worldwide 8er production, exterior colour, upholstery, colour combination and much more. 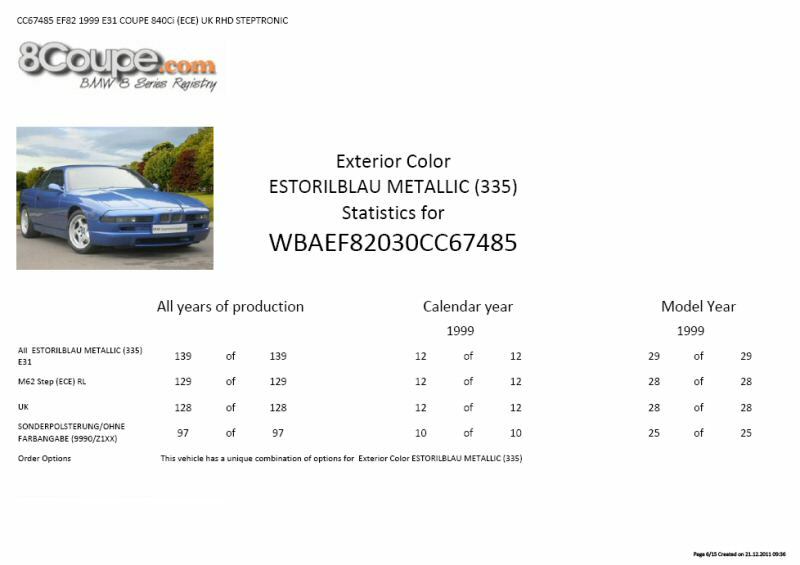 Each VBS-Report consists of 10 or more pages filled with statistical figures, highlighting almost 100 data points of any given 8-series coupé within the entire production cycle between July 1989 and May 1999. This report makes full use of the aggregated 30,621 build data sheets, inventoried between 2004 and Fall 2006 and also contains archived image data. VBS reports will only be issued to registered and approved owners. Follow this link to the VBS-R page for in depth information. The 8Coupe.com team wishes all 8er owners a Merry Christmas and Happy Holidays. Thanks - excellent report - thank you very much. Swift and well presented - perfect addition to car info pack. Thanks! I am remiss in not thanking you earlier. Very nice piece to add to the car's folder and great reference material. For CB73789 I could not be happier with the results, the information presented is beyond my expectations. To find my my car 1 of 16 in all productions years is mind bogeling. Sorry for the delay, but I´m just not as fast as you guys are! Fantastic work and perfectly fine presentation! Thank you so much for that great work you guys deliver. Thank you very much for all your time and effort. One happy RHD CSi owner . Thank you so much for the report, it's really interesting reading about the very car that is sat on your driveway. Appreciate the work to provide this information, thanks again. Fast response with great detailed report for my CSi. Thanks! Comprehensive, very informative and interesting. Thank you very much Reinhard ! I found the information you sent to be very interesting and informative. I VERY MUCH appreciate you doing this service for us. Great information to round out a well documented vehicle. Fantastic service, thanks a ton. Please add my thanks to all the appreciative comments. Great report, received overnight. It is amazing to think that over a quarter of all the 8's are logged on to your register. I wonder which other car has such a dedicated following. The BMW 8 series is a real sleeper in the world of collectable cars. By george840ci. I have just received my report and I must write to let you know that I cannot thank everyone involved enough for all thir hard work and dedication. A superb and worthwhile addition to the car's history. Professional, accurate, timely, personalized, with statistical data thrown in, and all done by a volunteer!! The information I now have on my 850Ci, compared to what I was able to get from Porsche on my 911, makes the 911 look like it's an orphan. Excellent information and well set out. Thank you for the effort guys. Much appreciated. Thanks a lot, it made interesting reading and also becomes a valuable part of the vehicle history. The detail was excellent and gives an insight into what was happening with 8 series sales at the time I bought mine in 1998. Great info supplied about my car. Looks like I might have a one of a kind colour combination here in Australia. Great history of the car. Thank you very much for the report. Quite interesting information in there as well as photographs from the time the car was at the UK till the time it was brought to Cyprus. One thing i want to ask though, is the power value.Power 280 at what type of measurement? Thanks so much for the very interesting information about my car. You people are doing a fantastic job. Keep up the good work. Thanks a lot for the info and great comunication, this site is truly awesome. You really increase the value of our cars with such a community. Fast response with great detailed report for my 850i. Thanks! a very quick response to my request. Very useful information and fast response from the team. Thanks so much for the VBS for my car, it was fascinating to learn that it was a show car for the 1997 London Motor Show. Thank you all for the very interesting information about my car. You are doing a fantastic job! I am so happy that I found this site. An astonishingly quick response to my request and the report is full of facinating data. Many thanks. I'm delighted to have found this website. With so few 8 series in Australia, I now feel part of a community with a common interest and passion. This is an excellent document, provided some fascinating info on my car. I am impressed with the prompt response to my request regarding my recent BMW purchased ,Please keep up the fine work and dedication shown by this site to keep these fine cars alive. Fantastic work, thank you very much! Thanks to 8coupe members, i have eveything i need for my 8 ! Thanks for the prompt delivery! Excellent report though unable to read some of the content in the photos on the last page - maybe to do with my IT skills rather than the report itself? I'll get in touch if I cannot resolve! Wonderful! Helps fill in some of the gaps in the history. Same problem as Ed (above). Some of the docs in the photo pages are too small to read and the PDF will not allow me to isolate them and enlarge them. If I enlarge the whole page the docs get blurry. I must not be enough of a computer nerd. Orrin, I contacted Reinhard the registrar directly and he very kindly sent me the full ".pdf" files which allowed me to access all of the information on the report! Reinhard has forwarded me a VBS report of some 14 pages which contains some interesting even amazing information. I am very thankful of Reinhard's efforts and the data provided which states I have a unique one of a kind Australian delivered 840Ci M62 Steptronic and one of only 8 globally. For a 17+ year old car its looks and presentation proves its a classic headturner. I had to get a small part from Adelaide BMW last week and the staff were drooling all over it as some had not seen a 8 series before! BMW dealer and all he could get was the original build sheet and sticker price. Thanks! Great complement to my cars documents! The report provided by Reinhard was detailed and impressive. Information is provided with great detail. It would help if the photos provided could be zoomed but nevertheless the information is great. Will provide some more photos in a few days as some of the photos in the document are wrong. Great job, great site, brilliant outcome. Thank you very much Reinhard for such a detailed and interesting report. The information is very fascinating and is certainly of great value to me in my efforts to restore my car back to it's former glory. I did send some more pics (Namely the interior of my car) which I hope you received. If not, I will be happy to email them again. Many thanks once again for your hard work. Thank you very much Reinhard, great document! What a great work has been done to produce these statistics, when you think that Bmw is almost unable to tell you how many cars were produced in a specific color....thanks again! Excellent document with a lot of information of your car, and how it will compare with some other BMW E31. Great job ( as usual ). Excellent report - lots of useful info, and very quick too! Thanks so much for such detailed information on my car. Truly a must have for all owners to keep along side all the other paperwork relating to such fantastic cars. This is invaluable information, and shows how important a united site like 8 Registry is for the owners of such unique and beautiful vehicles. Thanks for the information and effort. It shows in how many new members the site is getting. Please keep this site going. Thanks very much for the swift return of my report, great information to add to the cars history. Wow what an invaluable report which has only increased the value l place on my 840. The quality and depth of information provided is amazingly comprehensive. I can thank you enough for this information. Thank you so much Reinhard for this ! Thank you for everything. It's a very good work which you make there. Concerning the report, 1 of 1 appears 19x so I'm very happy! Thank you again. Best Regards. you are doing great job guys! thanks again.. Thank you very much Reinhard, it's a great report with valuable information! It's really superb that you collect so many info about the E31 models. And the website is also interesting for future E31 owners before buying one. This report is excellent information. I thank 8coupe.com for sending the report and hope that you all will continue to help 8er fans with knowledge about their vehicles. Amazing report! I got the report in less than an hour! Great job. Thank you so much. Extensive report on my unique 8 arrived in less than 24 hours, and it's already updated with recent photos that I provided earlier! Reinhard is an invaluable asset to the E31 community! Excellent report - I've found things on my 850ci that I didn't know I had! Thanks for the content and the quick turn arround. Thank you for the report. Without it I was completely lost as I am new owner of 8 series. Gave me lots of important information that I had no idea about. Thanks so much for the report. It’s great! CC89728 thanks you and I thank you. The report is really great, lots of good information. How do I access the archived photos?